Get creative this year with your family reunion! It’s soon to be full on summer time, and typically that means a family reunion is on the schedule. Are you planning one this year? Here are some quick tips to help get the ball rolling. Don’t forget to send out the invitations! With this as probably the easiest step, make sure it’s done first and you don’t miss anyone. Make these invitations inviting and super special by including personalized ribbons. 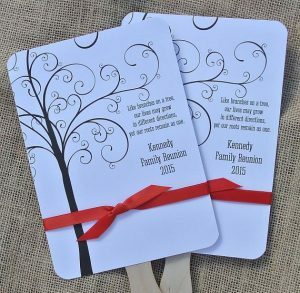 Simply print up your invitations however you would like and wrap a length of ribbon from a ribbon roll that has been customized with the family name or motto and the date of the party. Choose from almost any color and make it part of your theme. Don’t want a traditional invitation? Try using a custom badge ribbon imprinted with all the details. Most of our ribbons can be printed with your choice of text or logos. Simply provide all the party instructions and details and choose your favorite color. Badge ribbons are also a great way to identify people. Start with name badges so everyone won’t be guessing people’s names all day and attach badge ribbons to familiarize each other with how they are related. Create custom ribbons with words like cousin, aunt, sister or simply choose a last name to indicate which family line they originate from. Another fun way to get people excited for the reunion is to personalize a custom ribbon roll with the family crest or use tartan colors. Even if you’ve never had a family crest, create your own and get it printed on a colorful ribbon. Use these wonderful ribbon rolls for decorations on tables, chairs and anywhere else you can come up with. Even tie them around favors for each guest to take home. Rosette ribbons can also play an important part of your family reunion. Order each rosette with a title, placement or create your own custom rosette to present to winners of games and events that are held during your reunion. Give a rosette to everyone that participates or choose winners. Don’t forget to involve the kids in all the fun. From may poles using ribbon rolls to personal ribbon wands there’s a ribbon for everything. 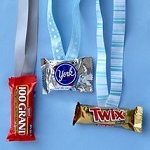 Here’s a cute idea: make kid awards using personalized ribbon rolls fashioned into a lanyard with a candy bar attached at the end for a medal. Choose any candy and any ribbon and make sure all participants get this coveted award. 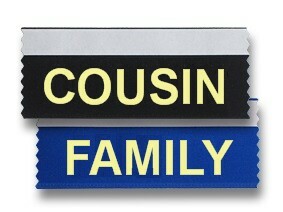 No matter your ribbon choice, be sure to make this family reunion a memorable one with your own personalization. From names and dates to themes and mottos, the sky is really the limit here. Make it your own and have some fun. But don’t forget the sun block! Hi, Brenda! Thank you for your interest in our blog. We love getting comments! As far as getting some ideas for ribbons for your family reunion, badge ribbons, ribbon rolls and rosette ribbons can all be turned into something to pin onto your guests. Choose a style you want and just attach pins or tape. Badge ribbons are probably the easiest idea, but rosette ribbons are great if you’re looking for something super fancy! If you need any further assistance with placing an order, please give us a call, and we’ll be happy to help!